Two nights ago the Half Acre Beer Co. crew, my brother and I, had a great time joining Sam Calagione and David Phillips for an exclusive beer and cheese tasting at Sheffield's. Our taste buds were in bliss experiencing 12 excellent Dogfish Head craft beers on tap (many of which I had never tasted before). The cheese pairings were absolutely fantastic. One beer was totally unexpected...Johnny Rawton, a hopped up pilsner style. It was super clean in both malts and hop bitterness. The hop flavors and aromas were also upfront and extremely clean, not what you would typically find with German varietals. Having the chance to talk with Sam Calagione one-on-one was cool. He's totally rad, approachable, and had good advise about a brewing business model I have stewing in my mind. Randy Mosher was there, and it was great to sit and talk with him during the tasting. These are two brewers who have lots of experience, and enjoy talking about the craft. David Phillips brought 10 cheeses (from The Cheese Stands Alone) that all paired very well with their respective beer. One in particular was outstanding...Humboldt Fog from California is an aged, two-layer, soft goat milk cheese, separated by vegetable ash with an attractive white rind. While I was talking and tasting, tasting and talking, my brother jotted down excellent notes. Thanks David for letting me post them here. 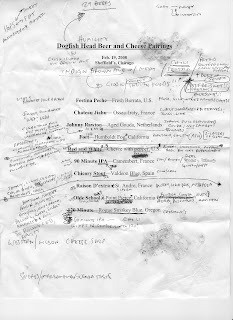 Below is a scan of the line-up sheet with scribbly notes and chili stains. Awesome! What a great oportunity. I'm jealous, both of those guys are inspirations for my brewing. Thanks for posting the notes too. It really was a good time. They are inspirations of mine as well. I fell in love with Radical Brewing, and was glued to that book for some time. Come to think of it, I need to revisit it soon. To see how real/down-to-Earth these guys are was nice. It's good to know that good people are doing good things, and that we are also capable of going far with our own interests.